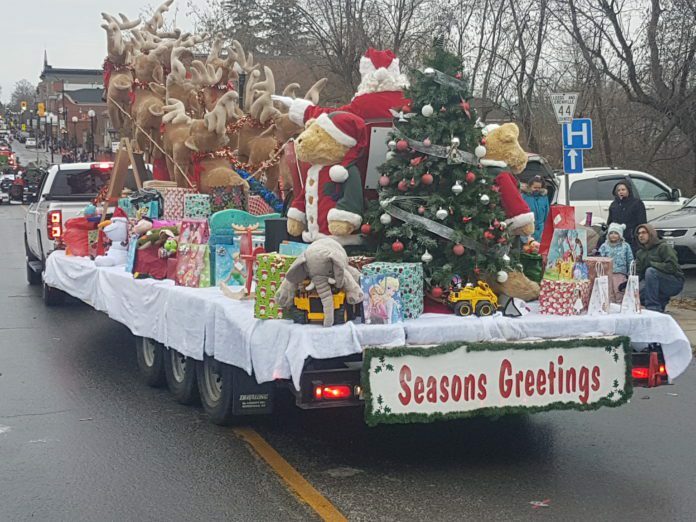 This year’s Kemptville Kinsmen Santa Claus Parade appeared to be in jeopardy because of a miserable forecast which called for freezing rain. The decision was made that the show would go on, so everyone involved crossed their fingers that somehow the nasty weather would pass us by. Though it looked bleak right up until the final minutes before the parade, the rain stopped and the parade came out to shine. The Town Crier was out early walking the parade route, warding off the rain and passing out chocolates. 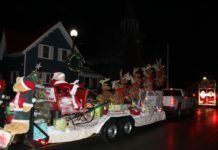 This year’s parade theme was inspired by Christmas movies. Onlookers were treated to some very creative floats, including an entry by Juice FM that recreated the movie Christmas Vacation with the Griswald Family, complete with their iconic RV. Some other floats included The Nightmare Before Christmas, A Charlie Brown Christmas, and The Polar Express, which all appeared to have taken a lot of time and effort to construct. Choosing a winner would have been very difficult with so many thoughtful entries. For the animal lovers in the crowd, there were a number of horses, ponies, and miniature horses, whose presence made some of the young ones squeal with delight. There were also a large number of dogs of all shapes and sizes, from Great Danes down to Chihuhuas, that were riding on the floats and riding in vehicles, but most were walking along beside their humans. There were even some reindeer sightings, but more on that later. 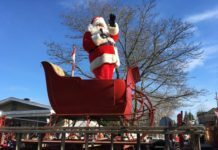 A wide selection of vehicles was on display in the parade as well, with everything from golf carts, bicycles, ATVs and tractor trailers, to mail trucks, vintage fire engines, pickup trucks and kids electric cars. It was interesting to watch several politicians, standing up in the backs of pickup trucks, try to maintain their balance with all of the stopping and starting of the parade. There was lots of entertainment provided during the parade, as Precision Cheer and Dance performed a number of routines along the parade route. There was even a marching band that played some great Christmas tunes to get people in the mood for the guest of honour. Speaking of the guest of honour, Santa Claus eventually arrived on the scene once all of the other floats had gone by. Santa’s reindeer accompanied him and appeared poised to take off at any second, but Santa wanted to make sure that he was able to see as many children (of all ages) as possible. He even stopped at the North Grenville Public Library after the parade to see all of the children again, in case he missed any. Judging by the size of the bags of candy that children were dragging away from the parade area, it looked like they were just finishing up a second Hallowe’en. However, there was no denying that the smiles and laughter of the children weren’t fuelled by a rush of sugar, but by the sweet knowledge that Christmas was coming and that Santa would be returning very soon. Next articleDeck the halls with Small Halls!